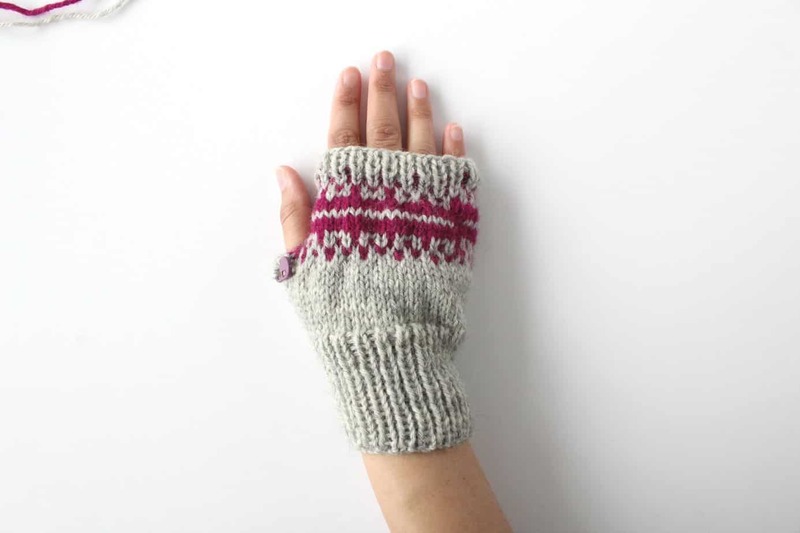 It’s been a year since I first released my pattern for the Fairy Tale gloves I made my niece. I had whipped these gloves up without meaning to really share a pattern and I only snapped a few very badly lit photos before sending them off. Since then, it’s been driving me crazy to see those pictures, and I kept telling myself I’d redo them. Now I finally have! 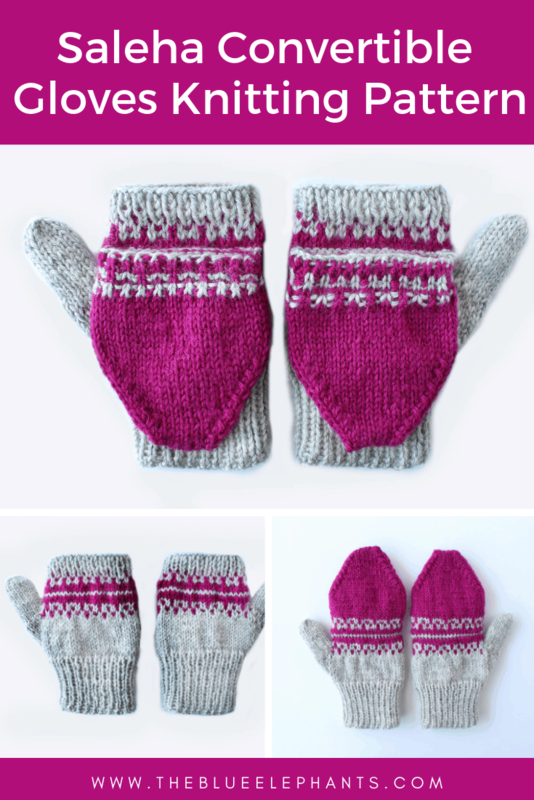 This is a really easy and pretty pattern on how to knit fingerless gloves and I hope you guys love the revised pattern and new pictures as much as I do. Let’s jump right into it! 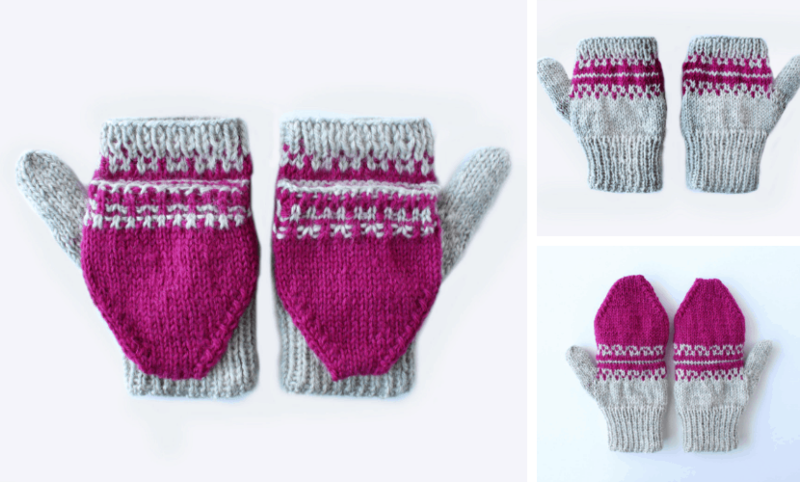 In this pattern update, I didn’t change too much, but I did make a few adjustments to give the gloves a clean look and make the pattern easier to follow. Instead of individual fingers, I ended the gloves with a ribbed section at the top. 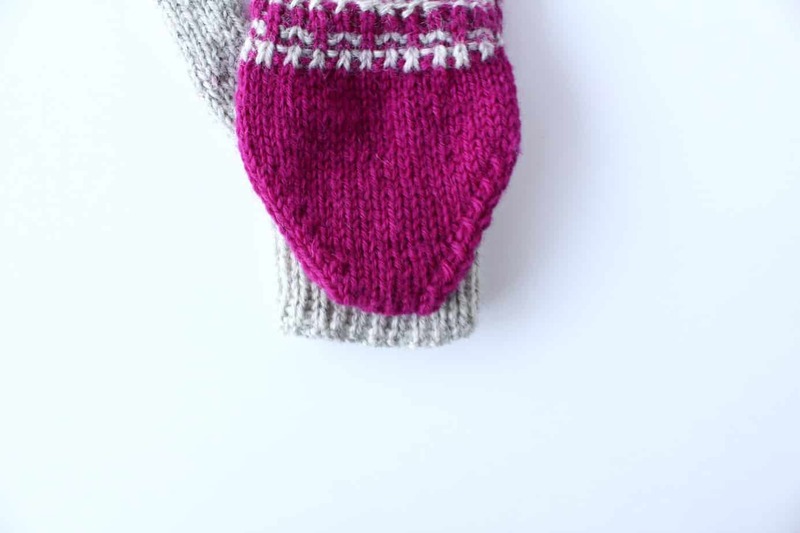 I also changed up the colorwork pattern on the cap of these fingerless gloves so it would go with the hand better. Another thing that people seemed t have trouble with was attaching the cap after it was made, so in this version of my Saleha gloves, I worked the cap into the hand for a nicer join. I still used the same gorgeous Knit Picks Brava Yarn in the colors Fairy Tale and Dove Heather. 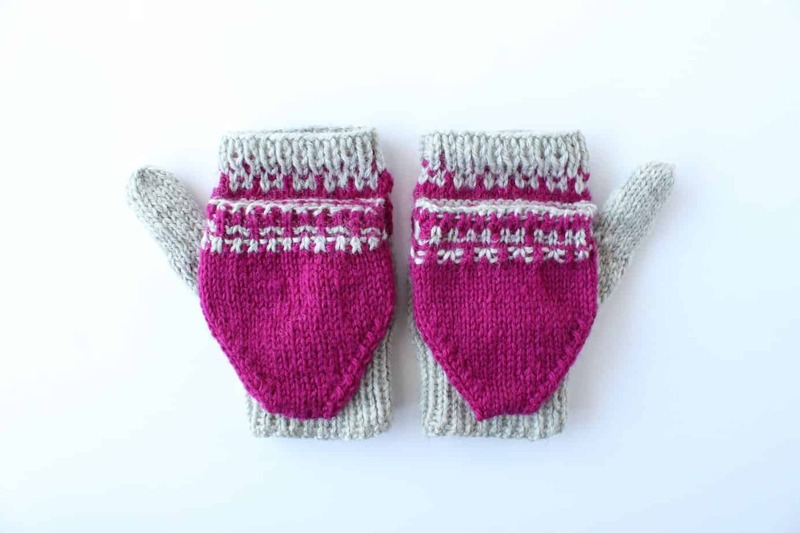 In this pattern, I wanted to show you guys not just how to knit fingerless gloves like these, but also how to customize them a little to get exactly what you want. 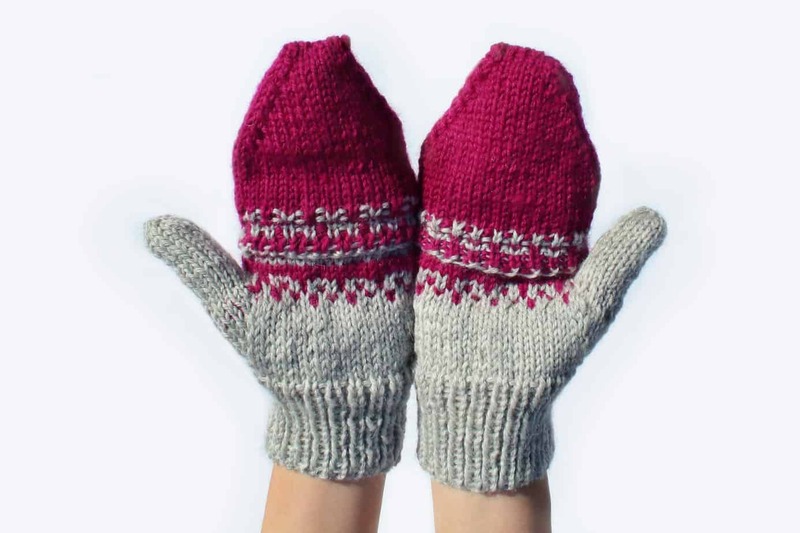 For example, you could skip the finger section and work the cap so you have mittens. Or skip the cap and work full fingers for regular gloves. You could even skip the fingers and the cap for something lighter and easier. Round 1: With color A (Dove Heather) and smaller needles, cast on 44 stitches using a knitted cast on and join to work in the round, being careful not to twist the stitches. Use a stitch marker to mark the beginning of the round. Rounds 2-17: *K1, p1* around. Continue working in 1×1 ribbing until the cuff measures 2.5-3 inches from the cast on edge (about 18 rounds). Round 18: Switch to larger needles. Knit 22, pm, M1R, pm, knit to the end of the round (45). The stitches between these markers will become the thumb gusset. Round 19: Knit all. You should have 45 stitches. Round 20: Knit until the first marker, sm, M1R, knit to next marker, M1L, sm, knit to the end of the round. You should now have 3 stitches between the markers. Rounds 22-27: Repeat round 5 and 6 another three times. You should now have 9 stitches between the markers. The stitches between these markers are the thumb stitches, and the rest are hand stitches. Rounds 28-31: Attach color B at the start of the round and begin working the Chart Pattern (below) across the hand stitches. 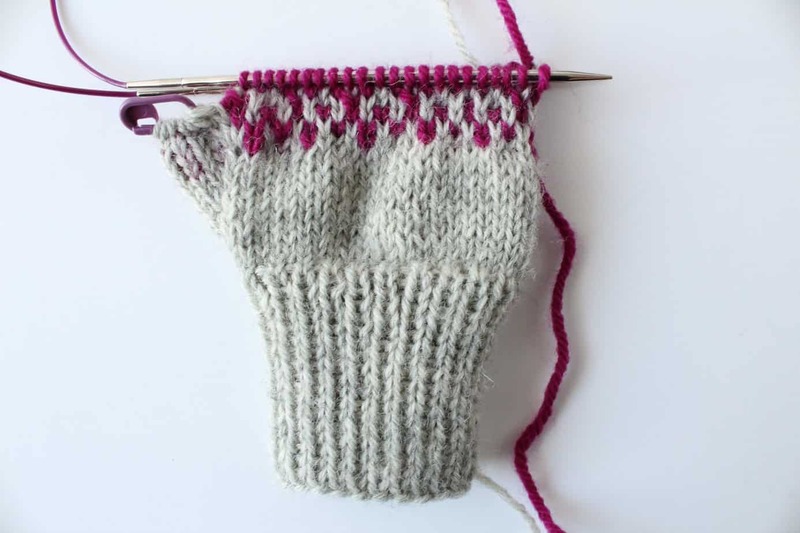 At the same time, continue increasing the thumb gusset until there are 13 stitches between the markers. 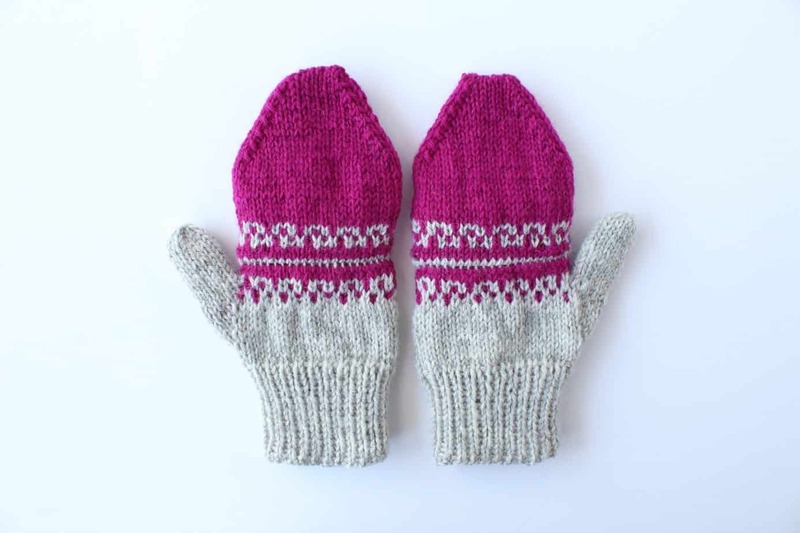 Make sure to loosely wrap your yarn after every stitch in the thumb gusset so that the color is carried to the other side without making the thumb stitches tight. Round 32: On the next round, work the chart normally, then move the 13 thumb stitches onto a bit of spare yarn. 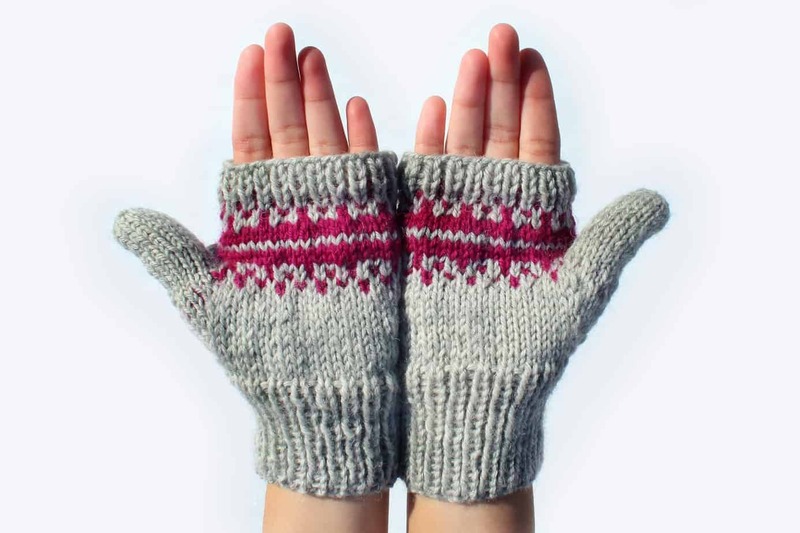 Continue knitting to the end of the round, being careful to knit the first stitch after the thumb stitches slightly tighter than normal. You should have 44 stitches to work the hand in the round. Rounds 33-44: Continue working chart pattern until the hand measures 3.25 inches. 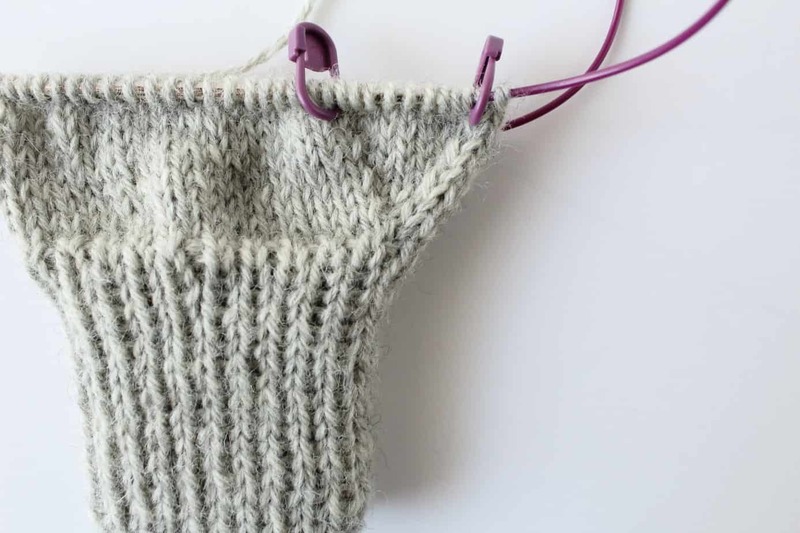 You may not finish the hand pattern at this point, but you can continue in the ribbed section or just work 2 more rows to finish. My hands are pretty short so I finished my chart pattern in the ribbing so I didn’t have to add that extra length. 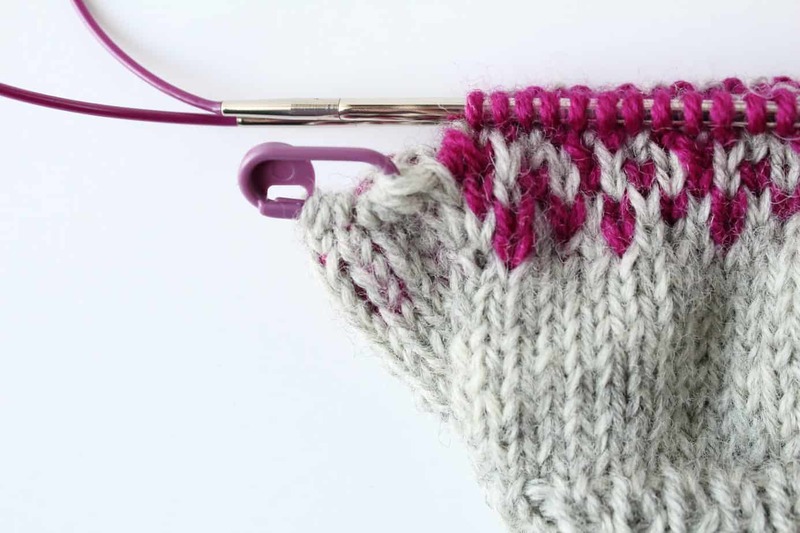 Rounds 45-49: Switch to smaller needles. Work in K1, P1 ribbing for 4 rounds, then BO in pattern. If you want, you can just add on the thumb next you’ll have learned how to knit fingerless gloves. 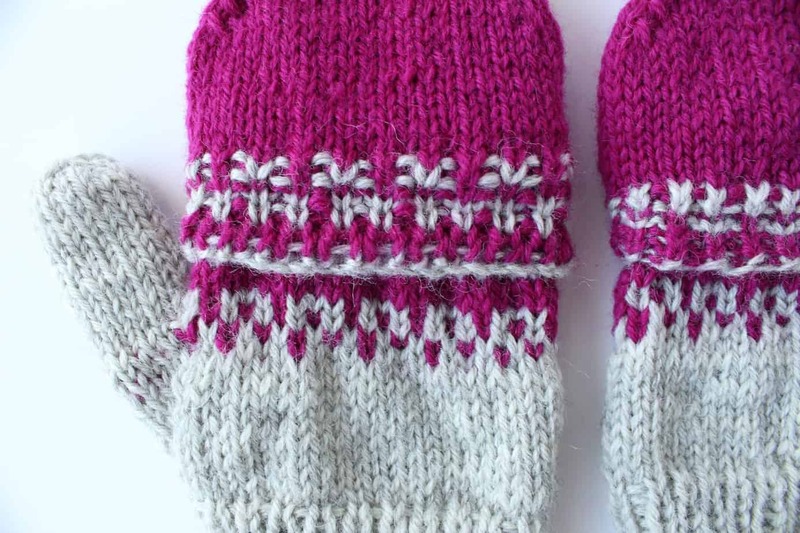 But for this pattern, I’m also going to show you how to add a cap to cover your fingers for those extra cold days. Round 1: Slip the held stitches back onto your larger needles, and with Color A, pick up one stitch from the and knit the rest of the thumb stitches (14). Rounds 2-15: Knit around for 14 rounds. Feel free to knit more round if your thumb is longer. Round 16: K2tog 7 times. Cut the yarn and thread the end through a tapestry needle. Run the needle through the remaining stitches and pull to close. Secure the yarn and weave in the end. 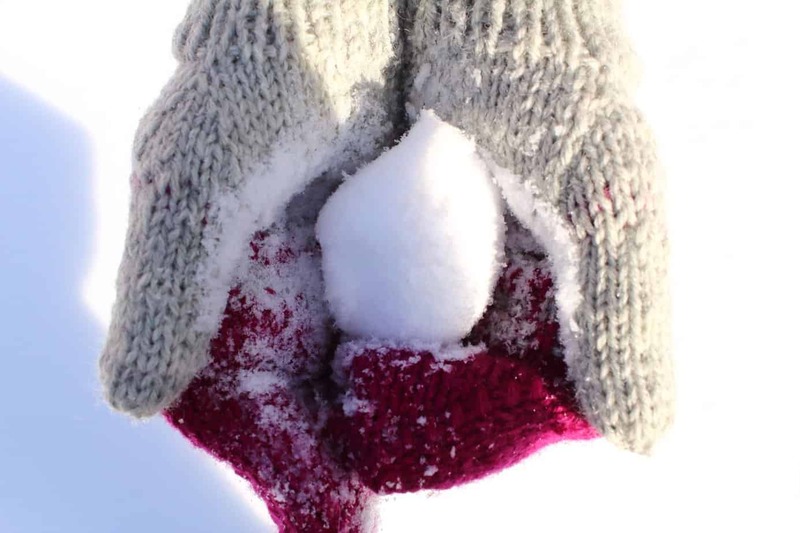 Make sure your gloves are facing the right way when you do this step! You don’t want to end up with two rights or two lefts. 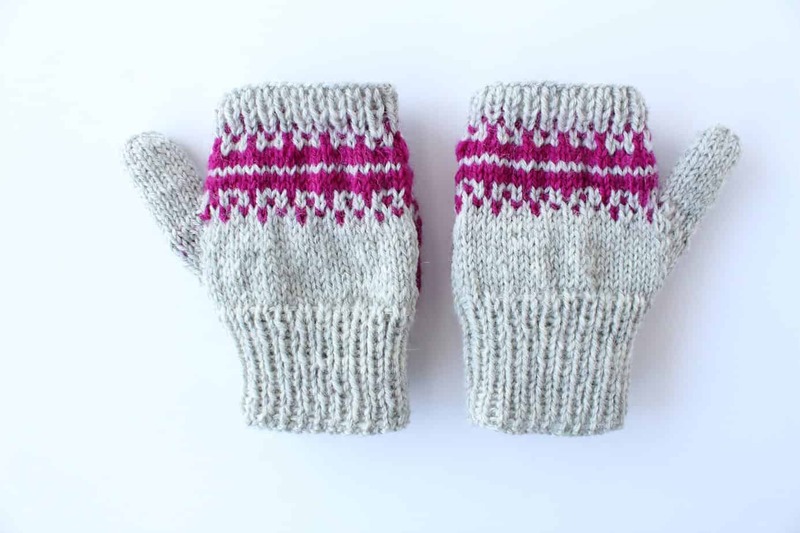 Set up row: With your needles and gray yarn, pick up and knit 22 stitches from the gray row in the hand pattern. Then cast on another 22 stitches using a long tail cast on or knitted cast on. Rounds 1-2: With your larger needles and the pink yarn, knit 22, then *k1,p1* over the next 22. Join to work in the round and work the second round the same way. Rounds 3-6: Continue working rounds 10-13 of the hand pattern, making sure to knit all on the front side of the cap and work in k1p1 ribbing for the other side. 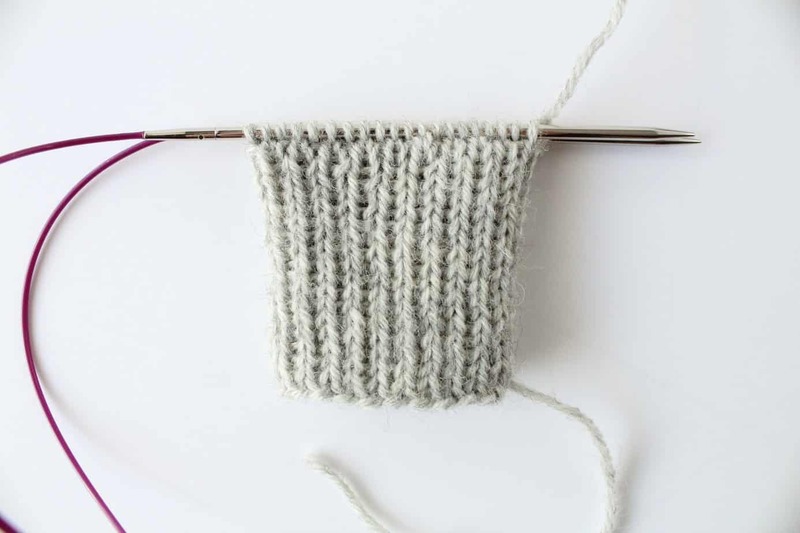 Rounds 7-16: Drop the gray yarn and using only the pink, knit all stitches around for 10 rounds. Now arrange your stitches so that you have 22 stitches on each needle. Round 17: Knit 1, k2tog, knit to the last 3 stitches on the needle, ssk, k1. Repeat on the other 22 stitches. Rounds 19-32: Repeat rounds 17 and 18 until you have only 8 stitches on each needle. Round 20: Using the Kitchner stitch, bind off the last 8 stitches. I found this tutorial on Red Heart that explains it really well! 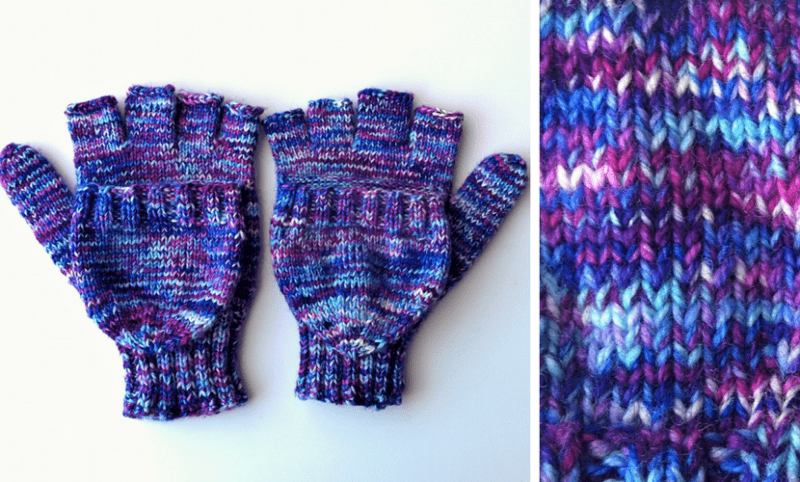 Finally, weave in all the ends and trim any excess yarn to finish your fingerless gloves! If you like, you can sew on a button or a snap to the cap and hand so it lies flat but I skipped that step here. I love how these gloves turned out and I think they’re much better than the original. Not only have a learned a lot in the year since I first made these, I really adore the subtle changes that made these better. 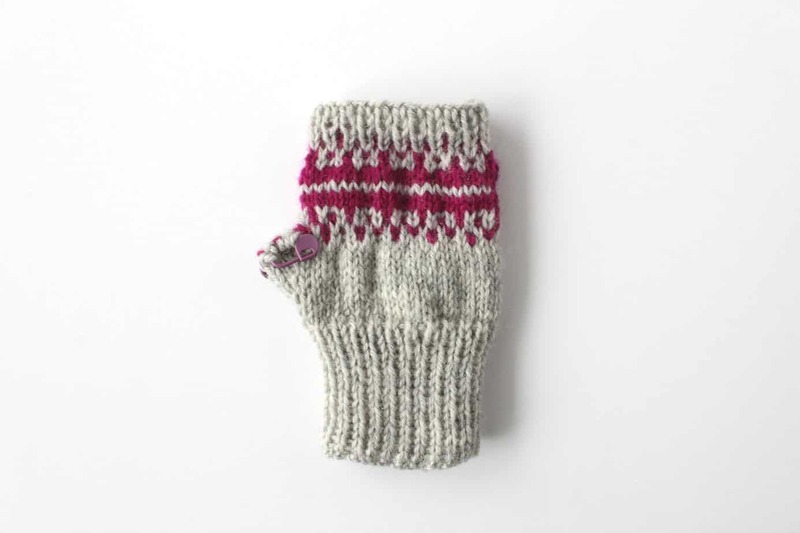 Now, the pattern on the cap mirrors the hand, there’s more of the pink yarn in the design, and I love the seamless, clean edge of the ribbed finger section. 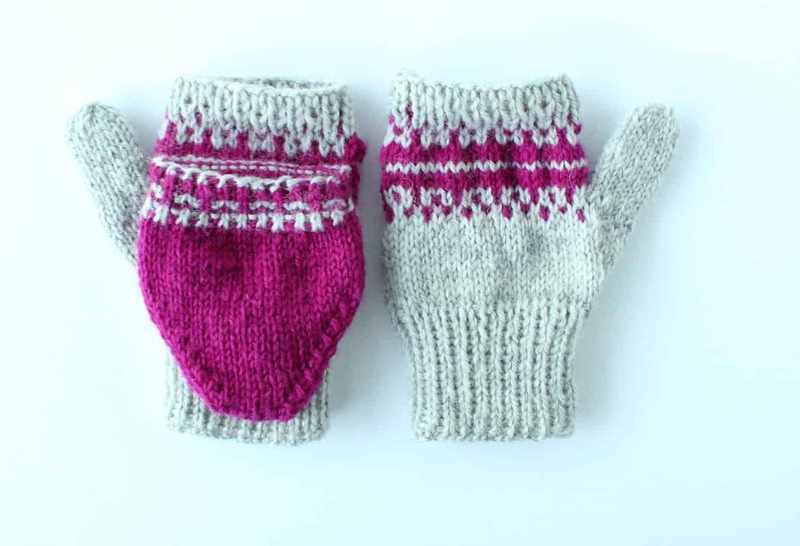 I also have another pattern on how to knit fingerless gloves, this time with half fingers and less colorwork, over here. 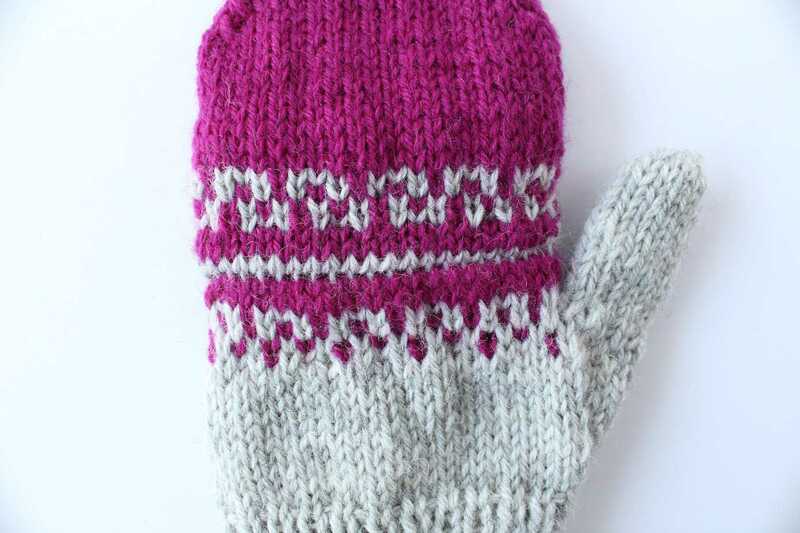 These are my Athena gloves pattern and they’re a great beginner pattern! Thank you so much for reading! I hope you give these gloves a try and share your pictures with me. I’m also updating the Saleha Beanie pattern that I made last year so be on the lookout for the matching beanie pattern coming later this week. If you liked this, please subscribe to the newsletter! 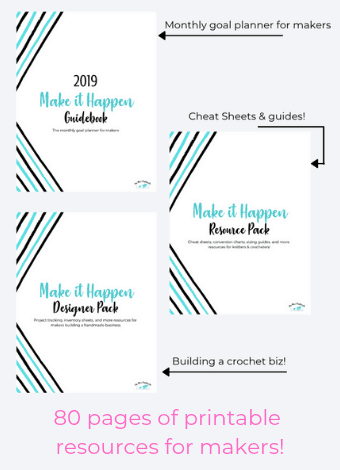 You’ll get new patterns, tips, and freebies sent to you every week, along with access to the subscriber-only resource library. Just fill out the box below and you’re done! How do I download the free PDF? It says I need a password. Thanks! The password for the resource library is for subscribers. If you sign up, you can get the password in your welcome email and see the other printables and cheat sheets there. That’s totally free, but the patterns were moved. Everything is 20% off this weekend too! Fantastic design. Amazing colour combination. Thanks for sharing.